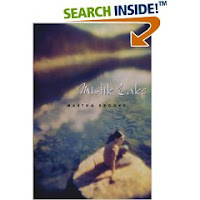 In the prologue, we learn that a car accident on Mistik Lake killed three teens in 1981. The survivor, Sally, never overcomes her sense of guilt, a burden she unwittingly passes on to her three daughters. Odella and her sisters can never quite figure out why their mother is so unhappy, but the underlying depression and shame shape their childhoods. Later, Odella finds herself growing and breaking away from her family, falling in love, and questioning all that she knows about her mother and her family's history. Another YAY from me. The characters feel real, and it's nice a quiet mystery: one that consists of the main character figure working out her family's sometimes painful past. I liked this title, too. Even though the subject is depressing, it has a very lighthearted and positive tone. I loved the way the family relations were depicted. Odella has close family ties with her sisters. YAY from me, too.